I got gay married, though it wasn't legal, when I was 6 years old. I married my best friend Julia, who was 9 years old at the time. Her little sister Leah, now editor and illustrator of my personal blog, performed the services of minister and helped us plan the ecumenical service in my pink bedroom with family, friends and stuffed animals present. Within our combined families were practicing Jews, Unitarians, Catholics, atheists and a secularly Jewish libertarian who had led the gay rights movement in Rochester in the 1970s. Tough crowd, as they say. I was drawn to Julia because she had red hair like Ariel from The Little Mermaid, who was the pinnacle of female aspiration and the mermaid I hoped to become by the time I was 16. Julia was also a Brownie (a lower-division Girl Scout) and wore a Brownie uniform the day I met her. I wanted to be a Brownie. 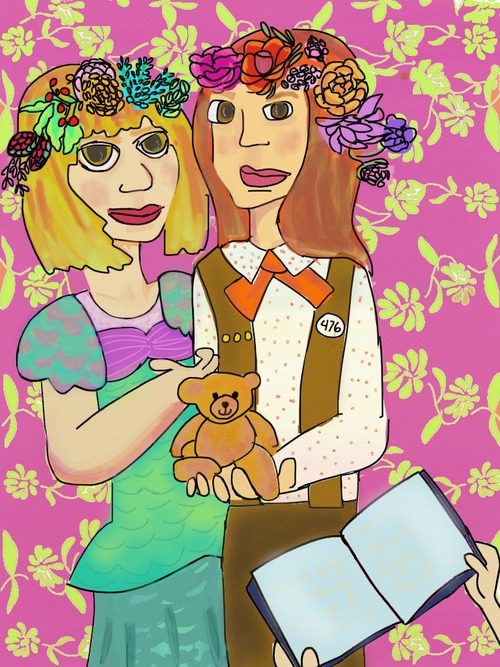 Julia was both a mermaid and a Brownie, and she was 9. She was to be my wife. Leah took the news gracefully. Though she was also 6, like me, she understood that Julia and I had a powerful love, and that it was simply her lot to facilitate. At that time, she had already been married for some years to her preschool sweetheart, the gay boy with whom I eventually went to prom some years later. I knew that my parents weren't married, but I don't remember knowing that they weren't allowed to be. Though I was somewhat aware of homophobia, I had no idea that Julia's parents were entitled to tax breaks and child custody laws that my parents were not. I'm glad I didn't know. I think that would have really pissed me off. I thought of marriage as an optional thing. I knew that "love makes a family," so I thought "marriage makes a great party" and, additionally, "Disney princesses have great weddings." Those were my personal laws. Julia, Leah and I, in planning our nuptials, knew that what we were doing was rare. However, because my parents were "married" for all intents and purposes (living together and raising me) and had not had a wedding, it seemed natural that we, as girls who loved one another, would get married in their stead. After all, why should anyone miss a big party and a chance to look like a princess? You'd have to be a moron to miss out on that. I wondered why my parents were behaving like morons. The wedding went off without a hitch and, over the years, dissolved into a silly and cherished family memory. In the years after my own dress-up wedding, I attended several beautiful commitment ceremonies (the prototype of the gay wedding), which Will & Grace's Will describes aptly when he says "Oh, please. Gay weddings? Some witchy lesbian waves a stick over you on a beach somewhere." At that very time, unbeknownst to me, my parents were forking over time, energy and legal fees to make their union and joint custody of me as legal in the eyes of the court as a married couple's. So while I was fulfilling the fantasy of gay marriage, my parents were navigating an antiquated legal system. I wonder who was having more fun. Now my mother R, after 36 years of commitment, says that she simply can't get married unless she loses weight for her white tux. (I guess we all have our Disney princess vanities.) And my other mother scoffs from the other room. Still, fat or thin, I think they'd look lovely in their white tux and Chico's kimono being blessed by a rabbi. If they are reading this -- and obviously, yes, my two lesbian Jewish mothers are reading this -- maybe they can still fulfill my childhood dream. Read more about growing up and being a grownup with two moms at two-and-a-half-women.tumblr.com.